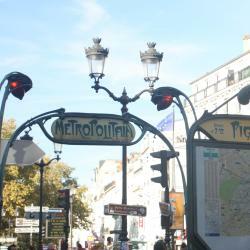 Looking for hotels near Simplon Metro Station? Located in the 18th arrondissement of Paris, a 15-minute walk from Sacré Coeur Basilica, Prince Albert Montmartre offers air-conditioned rooms with free WiFi. Hotels with great access to Simplon Metro Station! The Audran is in the heart of Montmartre one of the oldest districts in Paris. It offers rooms with private bathrooms with Wi-Fi access, just 220 yards from Abbesses metro station. Great location; close to metro and Montmartre! !